It was May of 2009. 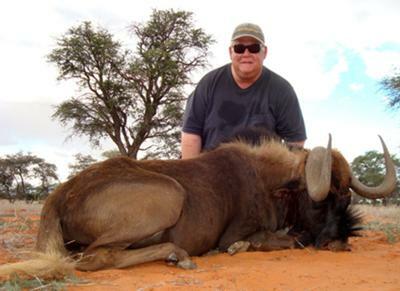 I was enjoying much success in trophy hunting at Uitspan Ranch in the Kalahari Desert of Southeastern Namibia. I was fortunate to have partaken of the gracious hospitality of the Duvenhage family. I had enjoyed exceptional trophy hunting, warm comradeship in a family atmosphere, luxurious accommodations, delicious home cooking, and cold beverages after a hard days hunt. It was in the evening of my next to last day at Uitspan. I had just shot a NAPHA gold medal Impala. I was very happy with the trophy and considered it to be my last trophy of the hunt. Michael Duvenhage, my Professional Hunter, and I were going over the paperwork for my hunt. I found out that I had some credit on my account. I was interested in harvesting a Black Wildebeest. Michael said he knew of a bull Black Wildebeest that had been forced out of the breeding herd. I am happy to hunt these old animals that have passed on their genes over many years. It is a great way to conserve wildlife following in the German tradition. The German trophy hunter always hunts the oldest animal; not necessarily the animal with the longest horns. NAPHA offers a Conservation Medal for an animal past it's prime but still of outstanding character. NAPHA also offers a Field Medal for an old and venerable animal that is still of Gold Medal dimensions. NAPHA makes certain that the old German hunting traditions are carried on in Namibia. That evening we had a wonderful meal at Uitspan. Michael grilled Karakul sheep chops over Camelthorn coals on his Braai. The steaks were very rich, meaty, and tasty with a lot of grilled steak fat. I never knew that mutton could be so tasty. My father, who was fed British mutton in England after WWII, had told me that mutton was no good. The Karakul mutton grilled at Uitspan by Michael could be served in any elite restaurant, anywhere. Tienie, Michael's wife, also made yeasted bread that was also roasted over the coals. I think they called them "braai brood" (grilled bread). They were eaten with home made Guava jam. Delicious!! While we were eating Michael and I talked of our hunt for the Black Wildebeest. I preferred to take him after a stalk on foot. I had done quite a few stalks in my time at the ranch and would like to try to stalk the Wildebeest to the best of my abilities. The next morning Michael and I drove to the part of the ranch where the Black Wildebeest was residing. We found his tracks in the red sand. Michael looked low, under the tree canopies. He said he spotted the bull. inquisitive. He said they can spot you and start walking toward you because they are so curious. The Black Wildebeest bull spotted us and ran at top speed from us. I caught a glimpse of him running through the trees. We took my rifle, the video camera, the shooting sticks, and a pair of binoculars and started to stalk the bull. The tracks of the bull were very easy to see in the damp red sand. It had rained in the Kalahari the last 3 nights and the sand was wet and fresh tracks were easy to see. It is very rare that it rains in the Kalahari in May. We followed the tracks for perhaps a mile. I was working up a good sweat but enjoying the hike. Michael said the bull was heading toward a water hole about two miles distant. We continued to track the bull. I let Michael do the spotting. I more or less followed in his shadow and looked down so I could see the tracks, did not trip, and did not step on a Puff Adder. The bull started to head right from the direction of the waterhole. Michael was convinced that the bull was headed for water. Michael veered left and attempted to intercept the bull on his way to water. We walked another one half mile. Suddenly, we saw the Black Wildebeest bull bedded down under a tree perhaps 200 yards away. The bull got to his feet and started to walk towards us. Michael said the bull was curious and perhaps did not know that we had been following him for two miles. I put up the sticks in a kneeling position. Michael aimed the video camera. Michael said I could shoot if I got a clear shot. There was a branch in front of the bull. The bull came forward and faced us head first. I could only see it's head, chest, and legs. I tried a shot. BOOM!! The bull dropped in his tracks at 180 yards. Michael said that his ears were ringing but he got a good video. It had been a wonderful stalk for me. I was covered in sweat but felt great. We walked up to the bull. The bull had large bosses and measured enough for a NAPHA Gold Medal. It was a wonderful trophy; an old mature bull in the German tradition. This bull was old and venerable and still had Gold Medal dimensions. He probably qualified for a Field Medal issued by NAPHA. I had harvested a multitude of first class trophies at Uitspan. The Black Wildebeest was the "cherry on the cake". It had truly been the hunt of a lifetime and one of the most memorable experiences in my life. That night we had Windhoek Lager to celebrate. Tienie cooked a Duiker Potjie. The Potjie was the best meat that I ever ate. Any chance we could see the video somewhere on the net? Great story, always good to hear when international hunters enjoyed their African experience. Great story! Hunting, eating and having great time and seing great places. Good job dude! This last hunt of the trip was one of tradition. A mature animal, a trek across a beautiful area, and finally a meeting of two destinies. The creature faced you and as a true hunter, you dropped him in his tracks, WEIDMANNSHEIL, and WEIDMANNS DANK. Loosly translated "good hunting" and thanks to the hunter. Keep up the excellent hunting and reporting. Bis nexte Jahre, bleibe sharf. (Till next year, stay sharp). I liked the picture at the beginning of the story. The stalking of the black wildebeest was interesting to learn about. The black wildebeest was impressive for his age and that German hunting traditions are followed in Africa. A great story of a hunt for a venerable beast.